This is the brick building under the I-380 bridges. 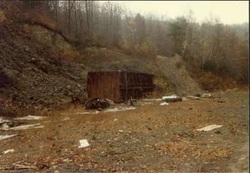 The right photo was taken in 2003. It still stands well although the back wall has collapsed. 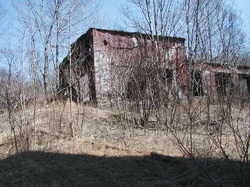 This used to be a pump house for the Delaware Lackawanna & Western to fill the steam engines. This is the backside view of the smaller Erie bridge. 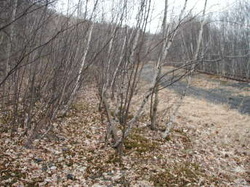 The right photo was taken in 2005 in early spring. 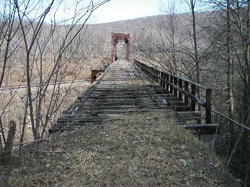 The ties on the bridge are not in good condition. 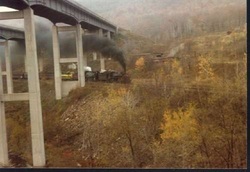 Steamtown excursion. This was before it became a national park. 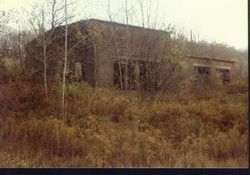 The pump house can be made out in the distance. 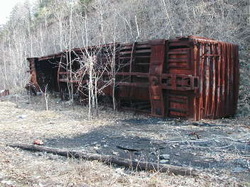 This is the boxcar now stranded here, not much has changed except some of the bottom is now missing. These wheels are now missing. 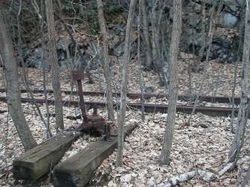 This is the first switch, you can see how much growth has overtaken the tracks. 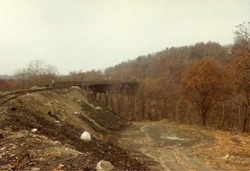 Near Rock Junction, you can see in the 1984 picture how they added the cross track to allow trains coming from south to switch over to the Jessup Branch viaduct heading to Drinker St. 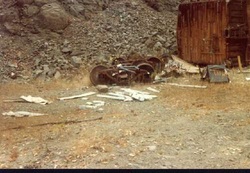 The right set merges in behind this photo. Note how much growth has occured between 1984 and 2004. 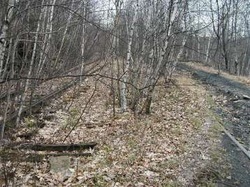 Soon there will be no trace of this former rail line. 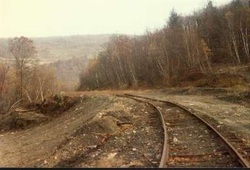 The 2004 picture is closer to the second switch verses the 1984 one. 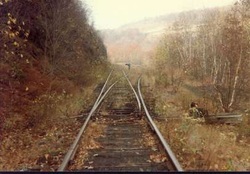 The two photos are taken at opposing angles, The tracks in the left photo lead behind to the Jessup Bridge. 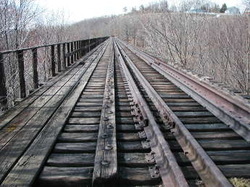 In the more recent photo, the right side is the same tracks leading forward to the Jessup bridge. 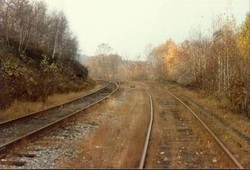 The other tracks in the left photo that lead to Haines Junction are not visible in the 1984 picture, but its to the right. 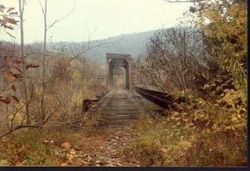 The tracks leading towards the Jessup Branch Viaduct. Note the fill. 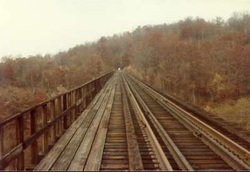 View from the top of the Jessup Branch viaduct bridge, not much has changed since 1984. The ties are still in good shape. The right photo was taken in April 2005.